This is a high-level summary of our key findings from the March 2014 Small Business Pulse Survey. 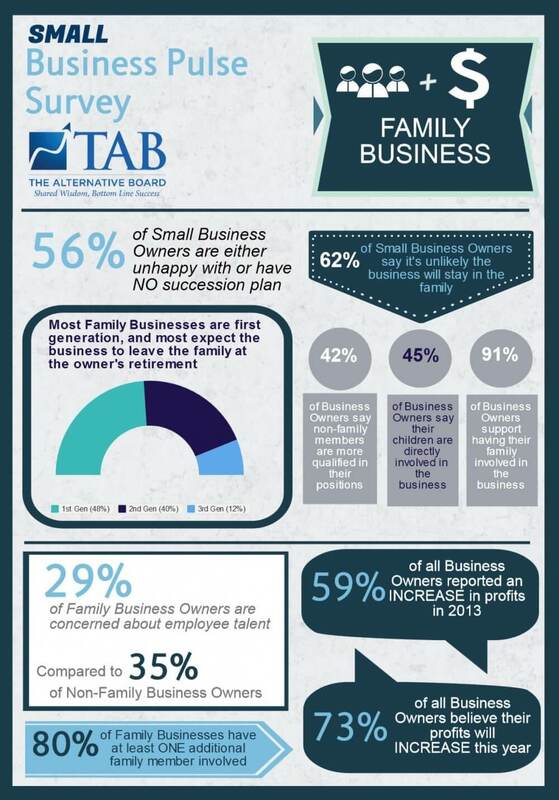 This survey concentrated on topics facing Family Businesses. The survey was taken by 380 business owners. 232 are family businesses and 148 are not. We intentionally targeted both family and non-family businesses so that we could assess whether certain challenges were more common in one type of business or the other. Profile of Survey Participants 47% of Family Business survey participants are first generation, 39% are second generation and 12% are third generation. In terms of family members involved, in addition to the owner, 43% had one additional family member involved in the business and 37% had two or three additional family members. When family members are involved, just about half of the time it is a spouse, followed by children at 45% of the time and parents at 23%. Succession Planning: One very interesting finding is that the majority of family business owners do not expect to keep the business in the family when they exit the business. Only 18% of respondents indicated that it is very likely the business will remain in the family when they exit. Overall, 38% indicated it is very likely or likely to remain in the family while 62% indicated that is very unlikely or somewhat unlikely that it will remain in the family. Only 44% of family business owners are satisfied with the quality of their succession plan. Satisfaction: Unlike some reports to the contrary, family members like being in business with their family. 91% of them support having their family directly involved in the business. Also, perhaps not surprisingly, family members involved in a business tend to agree on the vision for the business twice as much as non-family member employees. While family members may tend to agreed on vision, family members are also more likely to have disputes over business issues than non-family member employees. Talent: Family businesses are not especially concerned about employee talent. 35% of non-family business owners are concerned with lack of talent, while only 29% of family business owners share this concern. That being said, family business owners do rate their non-family member employees to be more highly qualified (42%) than family member employees (37%). Fairness: Contrary to common beliefs, family business owners believe that they are treating all of their employees fairly – family and non-family. 24% of family business owners rated holding all employees to the highest standard compared to 19% of non-family business owners. Family business owners and non-family business owners rate equal opportunity for advancement of all employees to be just about the same. 47% of Family Business survey participants are first generation, 39% are second generation and 12% are third generation. In terms of family members involved, in addition to the owner, 43% had one additional family member involved in the business and 37% had two or three additional family members. When family members are involved, just about half of the time it is a spouse, followed by children at 45% of the time and parents at 23%. employees fairly – family and non-family. 24% of family business owners rated holding all employees to the highest standard compared to 19% of non-family business owners. Family business owners and non-family business owners rate equal opportunity for advancement of all employees to be just about the same.